The My Tri is the brainchild of me, myself, and I, a Western Slope triathlete, and the solution to two of my biggest issues when it comes to triathlons. First, what’s the rush? I mean, assuming triathletes enjoy swimming, cycling, and running, why are they all in such a hurry to get things over with? Why not slow it down a bit and take time to smell your armpits along the way? And second, the standard order of events—swim, bike, run—doesn’t coincide with the sequence in which I would like to do things. Personally, I want to get the run over first, even if it puts me in dead last place from the get go. And when I’m done running, it feels great to take the weight off, meaning that the narrow slip of my bike saddle would be welcomed. And then, when my legs are good and tired and my arms are saying, “Hey, when do we get a turn?”, the only thing I want to do, the thing I absolutely need to do, is submerge myself in the water. Water is therapeutic. It’s relaxing. It’s rewarding, the prize at the end for all of my hard work, even if I still need to exert further effort and move myself a great distance through this medium. So at the heart of My Tri is this philosophy of slowing down and making the event last the entire day rather than an hour and a half. As I take part in it, I think often of the sticker on the back window of my vehicle: find your happy pace. And, of course, the swim is the last leg, the pot of gold at the end of the rainbow. And since Glenwood Springs has the ultimate pot of gold when it comes to outdoor swimming pools—and not too shabby of trails for running and riding either—this mountain community beckons me, annually, for the My Tri. So when is this event? Whenever you’d like, though I’d recommend spring, summer, or the fall months when there is less chance of encountering snow and ice (though such weather and ground conditions wouldn’t affect the beauty of the swim and may even enhance it). And what does the course look like? Whatever works for you. Know where you’re at with your training and always, always listen to your body. How much can you handle? Assess your day. How early can you start? How many hours do you have? Will you make time to soak in the warm waters of the Glenwood Hot Springs Pool and nap in the sun after you finish your swim distance and then have a cleansing shower before you head home? (That’s sort of the point.) Do a little research. You will find plenty of trails of varying lengths in the area for running and biking, whether you’re looking for pavement or dirt for either or both legs. And if swimming in ninety degree water isn’t appealing to you, then you can always hit the Glenwood Springs Rec Center, which, like the hot springs, has lap lanes available at all times during their hours of operation. This was my My Tri course. For my run, I wanted to take advantage of the vertical that Glenwood Springs has to offer, so I decided on the in-town Jeanne Golay Trail, which intertwines with the dirt road going up Red Mountain. I knew nothing about this trail; I just came across it while I, the race director and thus course creator, was researching and laying out the triathlon route. The six-mile roundtrip dirt road to a former ski area offers a reasonable climb, made consistent with several switchbacks, and the associated single-track trail cuts through the road, over and over, like the straight line through a dollar sign. This was perfect for me. Since running is my weakest leg, I trotted on the steady incline of the road for a while and then diverted to the steeper, mostly unrunnable, single-track for a bit until I felt like running again. The road was wide, well maintained, and confined by bright wild blooms—various purples, big bold yellows, and the muted dusty red of Indian paintbrush. I stopped several times to take photos of the flowers, a requirement when the early morning sun gleams straight through their petals, illuminating them brightly, like white and neon colors under black light. Noticing the flowers, and stopping to smell them or photograph them, is highly encouraged by the My Tri director, especially if your heart rate, lungs, or legs are demanding too much of your attention. 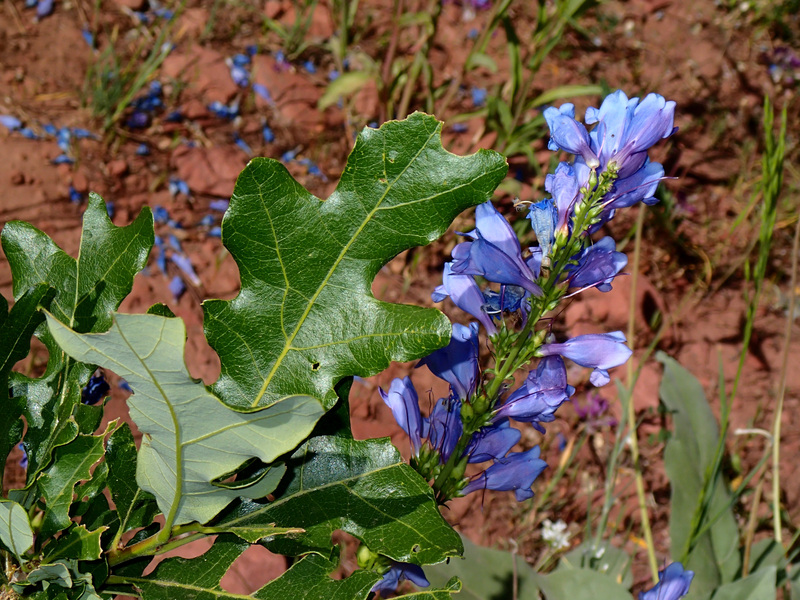 Similar flowers, though not as abundant, along with scrub oak and other lush greens, grew along and over the rocky single track sections I hiked. I came across several other people while on the trail, most with dogs, all friendly and stopping to chat, obviously oblivious to the fact that there was a triathlon going on here. Just one vehicle passed the entire time I ran on the road, a white truck, three guys hunkered down in the back. I noticed, as it went by, that it said something-something Paragliding on the door. What? Was the top of Red Mountain a place where paragliders launched? I quickened my pace. As I neared the summit, close to 8,000 feet high, and the road came to an end, I noticed bright hues—red, true blue, and sun-faded yet still vibrant orange—peeking through the aspens and evergreens. The wings! I quickly cut through the trees, stumbling over roots and brambles, pulling my camera from the front pocket of my running vest, trying to get there before they all took off. I saw three sails laid out, as I stepped into an open grassy area that looked like it had been cleared specifically for this purpose. 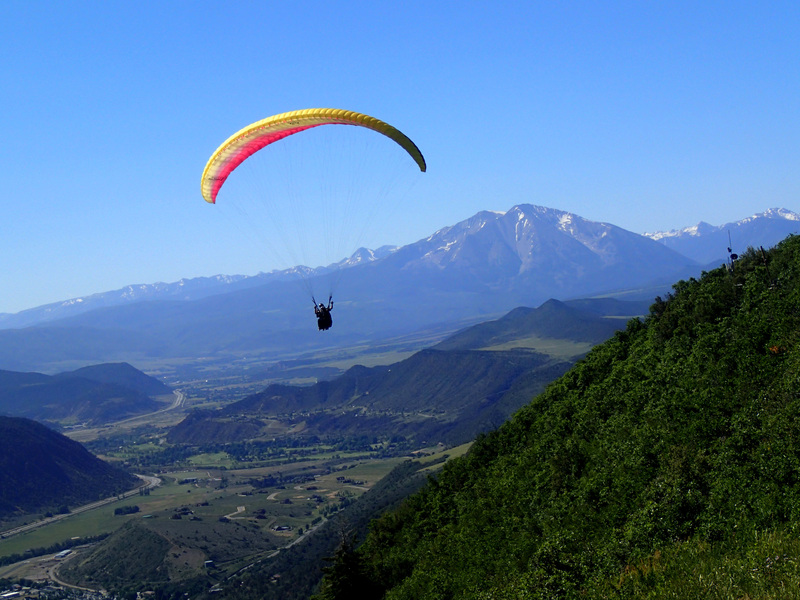 The one closest to the edge, the orange I had seen as I approached, snapped into the air, and its pilot ran toward the edge of the cliff, leaping outward until he was soaring high above the Roaring Fork Valley. I took in the view from this height, following the Roaring Fork River southward with my eyes as it disappeared in the hazy distance beneath the prominent, two-peaked Mt. Sopris, rising 12,996 feet in the air, and Aspen beyond. The other two paragliders belonged to the paragliding adventure business that had come up in the truck. It appeared that there were two experienced pilots that were going to fly, tandem-style, with their two guests, a mother and her son, who looked to be just nine or ten years old. I listened as the pilot explained to the boy that he was to walk forward quickly and then start jogging toward the edge of the clif f. Those were the only instructions; ostensibly the pilot would take over after that. I felt the boy’s hesitation, his wanting to ask, “And then what do I do?” And being the school teacher that I am, I wanted to tell him, though I knew nothing about paragliding, that that’s all he needed to know for now, that the guide would direct him through the next steps at the right time. But I kept my mouth shut and just observed. The man lifted the wing from the ground, slightly, and the wind grabbed it, bringing it rather suddenly into the air. “Run, run!” yelled the two experienced men. “Run, run!” echoed the boy’s mother. The boy, however, couldn’t run. His small body had been lifted from the ground, his feet at least five feet above terra firma, legs bicycling in the air as he tried to do as he was told. I giggled at the sight of it and then they were gone, floating above the tiny town, his mother left behind, hands clasped together in prayer-like fashion, beaming with pride and excitement. And then it was her turn. As she and her captain leapt from the cliff, she screamed with delight, the sounds dissipating in the wind as she veered to the right and flew away toward Mt. Sopris. I stayed a few minutes longer, taking pictures as they reversed back in my direction. Then, smiling, I started the run back down the mountain, down the road, settling into my happy pace. Of course, transitions are a big part of triathlons. They count as part of your overall time and therefore need to be well thought out in advance, everything in its place in order to move seamlessly from one component of the race to the next. Not so, however, with My Tri. My T1 transition between the run leg and bike leg consisted of sitting in my vehicle, texting my friend to let him know I was safely down the mountain, taking a quick look to see how the paragliding pictures turned out, and eating a peanut butter and honey sandwich. After this ten minute break, I started the engine and drove a few miles through town to the No Name exit, exit 119, along I-70, on the eastern edge of Glenwood Springs, the whole way recovering, cardiovascular-wise, from my run and listening to the eclectic music of Aspen community radio. I pulled into the parking lot of the rest stop there and leisurely prepared for my bike ride. There were people to watch, mostly families, between two of which I parked. To my left, a handicapped-marked van, belonging, I guessed, to the man walking with the awkward hobble, a young infant perched on his shoulder, its head bobbing greatly with the lurch of each step. And to my right, another father, leaning over his fussy baby in the backseat, saying, “I know, I know, it’s terrible, isn’t it? But you’re going to be just fine.” I smiled; how many times had I said those same words to my teenage girls over the years? As I buckled my helmet, a white-robed, black-bearded man approached the father on the right, holding in his outstretched hand a hefty slice of bread, topped with some sort of chunky spread. “A sandwich for you, my friend, a sandwich for you.” The father extracted his head from the backseat, eyebrows up, unsure of who this person was, what he was saying, and whether it was to him he spoke. “But you must take! It is the sandwich of life,” the man countered as he thrust the food toward the father’s face. Then he saw me and our eyes latched for just a second. Okay, time to get going on leg two. I jumped on my bike, not even walking it out of the transition area like I’m supposed to. Over to the sidewalk and down the hill, I dropped into the west end of Glenwood Canyon and started my 22-mile ride. Now, I don’t know if you’ve been through Glenwood Canyon, if you’ve driven along I-70 between Denver and Grand Junction. The canyon’s rugged thousand-foot-high walls, split by the raging Colorado River, are magnificent, but the dominating feature, ironically, is Interstate 70, with its incredible engineering of bridges and tunnels and elevated sections, including parts where the road going in one direction is built directly above the road going the opposite way. If you have been through here, you may or may not have noticed the recreational path that runs along the river the entire length of the canyon, tucked in close, and at some points even beneath, the eastbound lanes. While there are many places to bike in Glenwood Springs, including a 40-mile trail all the way to Aspen, the Glenwood Canyon recreational path, with all its wonders, is always the chosen bike route for My Tri. Though the cement path is smooth and wide, I take my mountain bike instead of my road bike. There are many people on the path and each presents as a different obstacle and none as something I want to encounter as fast as I might if I were on a road bike: a strolling older gentleman who can’t hear me yelling, “On your left!”who shudders as I breeze by; a family of five riding bikes, the youngest of whom—pedaling like crazy on his tiny beginner’s two-wheeler devoid now of training wheels—is in the middle of the path, his bike wobbling from side to side as he gawks around; two young lovers, walking abreast, hand-in-hand, tuned in to the beauty of the canyon, the marvel of each other, but unmindful of the rest of the world; a jerseyed cyclist on a road bike, barreling toward me, head down, communicating to me, somehow, that he’s got this game of chicken wrapped up so I best be scooting way right. As he zooms past (maybe trying to win the tri? ), I fear for the lives of those I just passed. When the path is clear, which it usually is, I pedal hard, a steady climb as I ride upriver. There is plenty to distract me from the burn in my legs, the squawk of, “Hey, what’s up with this? We just climbed a mountain.” Travelers at the popular Grizzly Creek rest area, which sits on the riverbank and offers picnic tables, information boards, and opportunities to stroll a bit and wade in the icy waters of the river, loiter on the path, perhaps not realizing that it is indeed a throughway until I, or another rider, come by, our helmets signaling that we would like to get by, that we are on our way somewhere. The traffic on I-70 zooms by on my left, sometimes no more than twenty feet away, fascinating as opposed to annoying since it is, at most points, inaudible next to the raging Colorado on my right. Rafts, filled with tourists in matching blue jackets, red life vests and red helmets, crash through the rapids and then come to a noticeable near-halt as the water calms in some sections. The dizzying rock walls loom above me, the tops too high to be seen beneath the visor of my helmet. I pass beneath road signs that meant for eastbound drivers, bigger than you would ever think when you are out of your vehicle and just a few feet beneath them. If I am lucky, a train will come through, squealing down the tracks on the opposite side of the river, adding yet another component to the transportation wonders of Glenwood Canyon. I stop and take pictures of some of the rafts going through the Class III Shoshone Rapids, then proceed slowly, but with much exertion, up the steep hill leading to the Hanging Lake Trailhead parking lot, the most popular hike in the state of Colorado. Part way up this hill, I pull over, dismount, and take a look between the slats of the fencing at the river below. I am standing completely underneath the eastbound lanes of I-70. Here, just below the Shoshone Dam, the river is about as vociferous as it gets in this canyon, the waves and their foam and spray forced upwards nearly twenty feet above the actual height of the river. Though I feel the cars and semis moving right above me, the thunderous river is all I hear. I complete the hill and my heart rate slows as I meander through the throng of pedestrians on their way to and from the start of the trail. After this point, I pick up speed and maintain a good pace all the way to the Bair Ranch exit at the east end of the canyon. I have ridden eleven miles. Making a 180-degree turn, I prepare for a faster second half now that I am going downriver. I’m not sure what gets into me, but I pedal as hard as I can all the way back, asking more of myself than I did in a real triathlon a couple of weeks ago. Oh, wait, I know why. It’s because the third leg is the swim, not the run. The swim is my favorite part and it’s mostly arms and it won’t matter if my legs are wet noodles. I’m hungry by the time I get back to my car an hour and a half after starting the ride. Where’s that guy with the sandwiches, the sandwiches of life? I make a race director decision that T2 will include a stop at Subway, just a few miles back in town and close to the pool. I order a twelve-inch turkey, no cheese and loaded with veggies, and eat half of it. The other half will hit the spot after my swim, I know. I check Facebook and get involved in a conversation with a friend about buying her bib for the Golden Leaf Trail Half Marathon near Aspen in September. Realizing that my T2 time is now approaching the one hour mark, I hastily tell her yes, I’ll take it. I may end up not doing the race, but in the least, the seventy bucks I’ll reimburse her will get me out there running and training. Later, I wonder what I was thinking as I realize I’ve never ran more than ten miles of trail. I must have been pumped up, feeling like I could do anything, being that I was in the midst of the full day My Tri event. And now, on to that pot of gold. My transition time extends a bit longer as I circle the hot springs parking lot trying to find an open spot. Well, it is Sunday afternoon. I kick off my running/biking shoes, slip into my flip-flops (ahh) and grab my swim bag, packed the night before with not only cap and goggles, but a good book, shower necessities, and a fresh change of clothes. I pay my $19.95 (cheapest ever entry fee for a triathlon, by the way) and go straight to the pool deck. I don’t need to change; I’m wearing a tri suit, comfortable for running, biking, and now swimming. World’s Largest Hot Springs Pool, Spa of the Rockies, the sign on the large clubhouse says. The spa-ness of it all hits me immediately; just the scent of the minerals is already soothing and restoring my tired muscles, my body sighing as the warm afternoon sun mingles with the muted sounds of laughter. I walk the length of the pool, all 405 feet of it, noticing that the seemingly hundreds of adjustable chaise lounge chairs are all in use, or at least veiled with a towel. No matter. I’ve got a mile to swim! I put my bag near a sleeping woman, so, unbeknownst to her, she can guard it while I do my thing. There are four lap lanes, which isn’t many for the number of people here, but they’re big. Nearly twice as wide as a regular pool lane and about 33 yards long, it’s easy to share if need be. Lap swimmers follow the arrows on the bottom of the pool, indicating that you should swim in a long, rectangular, counter-clockwise loop, using the middle of the lane to pass other swimmers, if you come upon them but you rarely do because the lanes are so long. I choose a lane that is at present empty and slide in, submerging myself instantaneously. Oh, the sensation. My hair, matted down from being in a ponytail and under my bike helmet, loosens and slowly fans out behind me as I linger beneath the surface. I come up, face first, hair compressing against my scalp, squeegeeing the warm water down my neck and back. Hints of sweat and sunscreen and the mild minerals in the water unite on my upper lip. If this were another triathlon, and I was about to start the swim, I’d be tasting dank lake water and a bit of fear, the dread of flailing bodies in close proximity to me, the trepidation of possible hyperventilation. On goes the cap. On go the goggles. I press them into my eye sockets, dip under, and push off the wall, shooting forward in a speeding streamline. As I surface, my arms are already churning, ready to go. They’ve been waiting for this all day. It takes but a minute to get into the rhythm: one, two, three, breathe right, one, two, three, breathe left. My legs kick, kick, kick, impossible for them not to, even though they’ve been through the ringer, unless I deliberately communicate to them to be still, to drag. But I don’t; I let them do what they are hopelessly trained to do. I swim mostly crawl, but mix in some breaststroke and backstroke as well, the former working different muscles in my legs, the latter giving my shoulders a respite from the afternoon sun. Yes, the water is warm, too warm for racing. But it doesn’t matter. All I have to do is find a happy pace and enjoy myself. I realize that it’s difficult to count my yardage what with the lanes being such a peculiar length, so I decide to swim for ten minutes, the approximate length of time it takes for me to swim 500 yards in a regular pool. When I stop and raise my goggles, voilà, there, right in front of me, is an available lounge chair. I better snag it, I think. I hop out and claim it with dripping cap and goggles. Presented with this invitation, I choose to take a short break. Highly recommended in the My Tri event, as you now well know. I dry off just enough to be able to handle my book, lay down (oh, what a feeling! 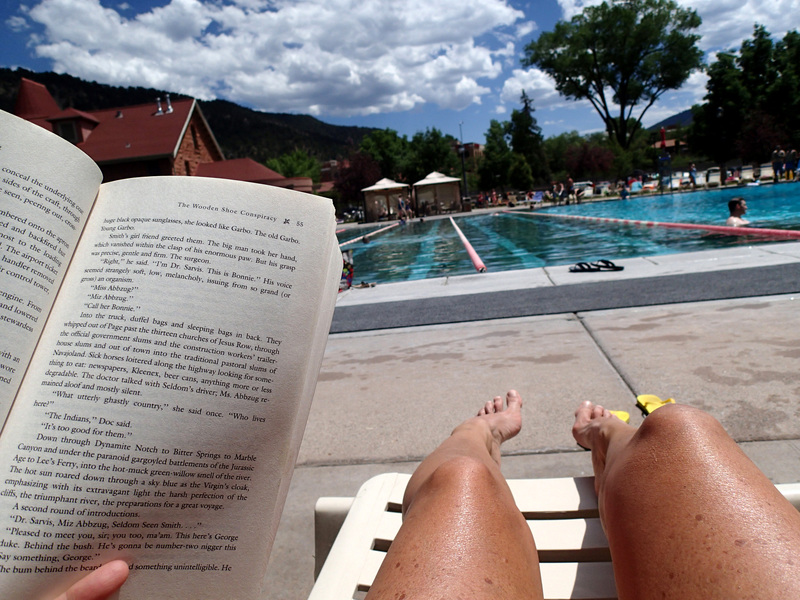 ), put my sunglasses on, and open up to where my bookmark is. Chapter Five. I read an entire chapter, surprised that I’m not drowsy, but open to the idea of napping for a bit had I found myself so. The end of a chapter must mean that it’s time to swim again. I get in and crank out another 500 yards or so. It’s remarkably pleasant, hardly, in my book, to be labeled exercise. Then, back to the chaise lounge. A man, pot-bellied, in damp white shorts that have a fleshy tint to them, walks by and says, “He he, if anything goes haywire with this pool they’ll be coming after you, you know.” I have no idea what he’s talking about. Then, I realize that he had looked at the cover of my book. I’m reading The Monkey Wrench Gang by Edward Abbey. Chapter Six complete and I’m feeling like one more ten minute swim. Make it twelve. That should be about a mile. So this is how the final leg of the My Tri works; I have to, well, I don’t have to, but it is suggested, that I swim 500 yards, read a chapter, swim another 500 yards, then another chapter, so on and so forth until I determine—not beforehand, but right here and now—and cross the finish line. As the crowd roars, I take a bow and flop into my chaise lounge, feeling exhausted, yes, but incredibly rejuvenated and relaxed. When the dripping has stopped and the second half of my sandwich is consumed, I gather up my belongings and head to the dressing room, where post-race goodies await: a clean shower with plenty of warm water and pressure, a slathering of Jergen’s lotion for my thirsty, sun-taxed skin, fresh cotton garments, and outlets near the large mirror into which I can plug my blow-dryer. On the way out, I check the time. Seven hours even. Perfect. After all, there’s no reason to rush through the My Tri. Thanks for doing this. It is really fun. I am reading this in bed and, now, I feel like a tuna. Oh we’ll, tuna can have fun. Connie, you are welcome and thank you for reading it and for commenting. I am really enjoying the process; it’s creative and challenging and rewarding and, as both you and I like, preserves some pieces of family history. Whew! In comparison to your other posts this really was a triathlon,or maybe a bidodecathlon…. Some 24 paragraphs(hehe), but I stuck it out with you. Well worth it, as always. 🙂 What a narrative by the way. yay! It’s a feature-length article! Hope it wasn’t biodecapitating for you. I guess you could still count afterward. Oh no, you didn’t. But you could cross me several times without even touching all the good things you’ve said about my writing. Appreciate it! I believe I’m confused. Your blog is the best one I’ve come across. You stories draw me in and your witty repoirte reminds me of a Robert Fulghum sort of style. I think you could, should put them in a book. It would sell. If I’ve misinterpreted myself in any other way my sincerest apologies. Whoops! Hope that “appreciate it” line didn’t throw you off. I meant to write, “I appreciate it” (all your feedback, etc.). I am not easily annoyed or upset or hurt or anything, so say whatever you want. And, no, I don’t believe you have misrepresented yourself. Plus, you are inspiring me to write more. So thank you for that!